I wanted a conical fermenter, and the smallest I could find in polyethylene was 80 liters; this determined the sizes of my other vessels. The Wort Hog Homebrewers club invested in a mould for a 50-liter fermenter, so now homebrewers have the option of a more reasonably sized brewery for homebrewing purposes. Now we have a quote for this Sinvac system (Download a .pdf quote for the 4 vessels). The three pumps are shown. From left to right, is the hot liquor tank pump, the mash/lauter tun pump, and closest is the kettle pump. The 2 taps provide hot water and wort samples respectively. The red connector on the far end is a recycle back to the hot liquor tank, allowing mixing of acid additions, etc. and improving the heat transfer on the HERMS. The vertical connector goeas to HERMS and/or mash tun recycle. The light switch switches the pumps on. 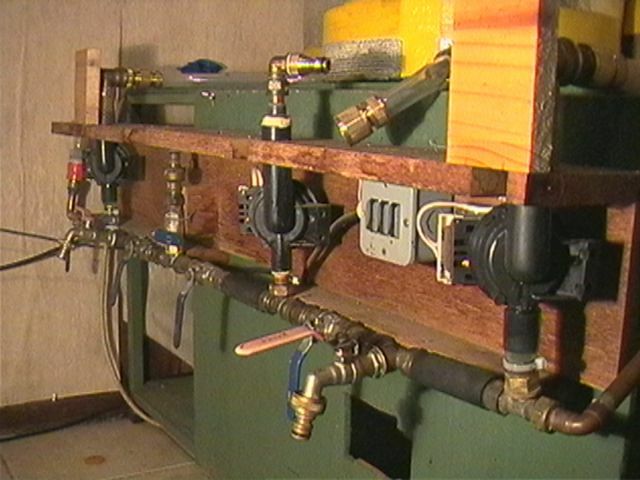 Note the brass quick-coupled garden hose connectors. The plastic connectors tend to deform with the hot fluids. The vertical bit of piping is the mash tun recirculation, and also used for the water during sparging. The three brass elbows are connected to the 3 washing machine pump outlets. The inlets of these pumps are connected to the brewing vessels. From left to right, they will be the hot liquor tank, the mash tun and the kettle. The quick-connect on the left goes back to the hot liquor tank, where the recirculation helps to mix acids and salt additions, and improve heat exchange on the herms pipes immersed in the hot liquor tank. The right hand disconnect goes to the counterflow chiller. There are two sample valves. The left hand valve alllows withdrawal of hot liquor, and the right hand sample valve allows withdrawal of wort. For the hot liquor tank, a geyser element with a thermostat (I set mine for 78°C) is sufficient. You need to fill the hot liquor tank the night before brewing, and have hot liquor for mashing in the next morning. For the kettle, use an electrical element made of Incoloy. This expensive austenitic stainless steel is commonly used for elements, but it is necessary to minimise surface fouling, and eventually element failure on your kettle. I always thought low energy density (kW/m2) on a kettle element was important, but some colleagues with high energy density Incoloy elements have enjoyed a long life on their elements and make good beer that does not seem overly caramelised. Here is a Powerpoint presentation (734 kb) I made to Worthog Brewers on homebrewery design in February 2003.